The NAACP announced plans to change their tax status, shortly after an-nouncing that Derrick Johnson would become the group’s new president. 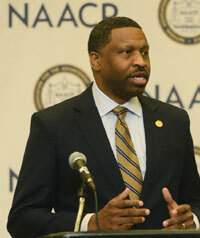 The NAACP announced plans to change their tax status, shortly after announcing that Derrick Johnson would become the group’s new president. Even though the NAACP is 108-years-old, the organization is struggling to modernize and stay relevant in a rapidly-evolving, social media-driven landscape that requires speed and strategic communications skills. Johnson, a native of Detroit, Michigan, lives in Jackson, Mississippi. He is a long-time member of the NAACP, who was elected Vice Chair earlier this year and served as the interim president after Cornell Brooks was forced out. Johnson attended Tougaloo College before earning a juris doctor degree from South Texas College of Law in Houston. The NAACP ousted Brooks in the spring of this year, a few months before the group’s annual convention in Baltimore.